The LETUS35 Extreme Adapter LT35EX77EX1 is a lens adapter for 35mm still camera lenses to adapt for use on video cameras. This adapter allows the video camera to have access to prime lenses that create a shallow depth of field. The Extreme offers the best quality from Letus35 and allows the user to work with an upright image. This model is optimized for the Sony PMW-EX1. Shallow Depth Of Field is a very powerful tool for telling a story and getting details across. Many movies use this feature yet cameras nowadays with small CCDs cannot produce this optical effect. The main purpose of this adapter is to bring shallow depth of field film look to low budget filmmakers with DV or HDV cameras. This adapter involves the concept of using a 35mm SLR still camera lens to project an image onto a translucent piece of moving glass. This projected image is then literally focused on by the DV or HDV camera and recorded. All this takes place in a tube. 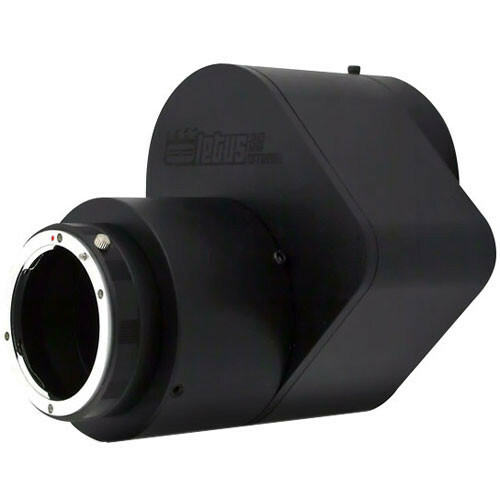 Letus35's concentration is on sharp focus, aberration, grains, barrel distortions, audible noise, vibrations and weight making their adapters an excellent optical accessory. They immediately update their adapters, if they find that changes are necessary. Image is read upright for easier operation and this adapter only loses 1/2 stop of light sensitivity. This kit comes with the 77mm adapter ring for camcorders with 77mm lens filter threads. This particular adapter kit features connection and optimization parameters for the Son PMW-EX1 camcorder. Box Dimensions (LxWxH) 9.8 x 9.3 x 9.3"
LT35EX77EX1 Extreme 35mm Lens Adapter is rated 4.3 out of 5 by 4. Rated 5 out of 5 by albertogerman from THE BEST CHOICE IN TOWN I shot commercials and the letus extreme change the visual of my jobs, attached in Sony ex3 camera offers awesome image and new perspective. trust me the best choice in town.